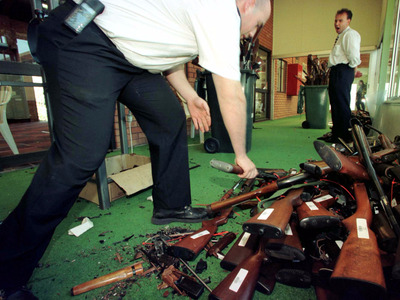 Reuters PhotographerGuns that have just had their barrels crushed in Sydney are stacked after they were handed over on the last day of the Australian gun buy-back scheme, September 30. Early Sunday morning, a gunman carried out the worst mass shooting in US history at Pulse, a gay nightclub in Orlando, Florida. At least 49 people were killed, and another 53 were injured. ISIS has claimed responsibility for what law enforcement has said was an act of terror. But the FBI painted a bizarre picture of the shooter, citing links to three different terrorist organisations within a three-year span. “There is confusion about his motives,” FBI director James Comey said. This massacre came just a day after a gunman targeted, shot, and killed “The Voice” singer Christina Grimmie at a concert in Orlando — and 12 days after Obama warned of ISIS sympathizers he can put on the “no-fly” list but can’t prohibit from buying guns. In 1996, Australia took action. Just 12 days after the worst mass shooting in the country’s history, the government passed a law that would become one of the largest gun reforms in recent history. Afterward, gun deaths plummeted. The changes remain the gold standard for advocates of gun control today. Bryant’s actions shook Australia to its core just six weeks after then-Prime Minister John Howard took office. As a federation, Australia gives its national government limited powers. So Howard stared down the challenge of convincing the country’s various states to support nationwide reform while the national government banned the import of specific weapons. For a while, some states seemed unwilling to pass the reform. Howard, however, made clear that his government would counter with a referendum to alter Australia’s constitution and give itself the power to regulate guns. Howard knew these efforts would be expensive, but he said he also knew they’d be worth it. Howard’s reforms passed, creating the National Firearms Agreement in Australia. Aside from banning certain semiautomatic and self-loading rifles and shotguns, the legislation required all firearm-licence applicants to show “genuine reason” for owning a gun, which couldn’t include self-defence. Aside from the NFA, Australia still need to remove the guns then on its streets. The country instituted a mandatory, federally financed gun-buyback program. The one-time national tax to raise the funds, however, required even more legislation. 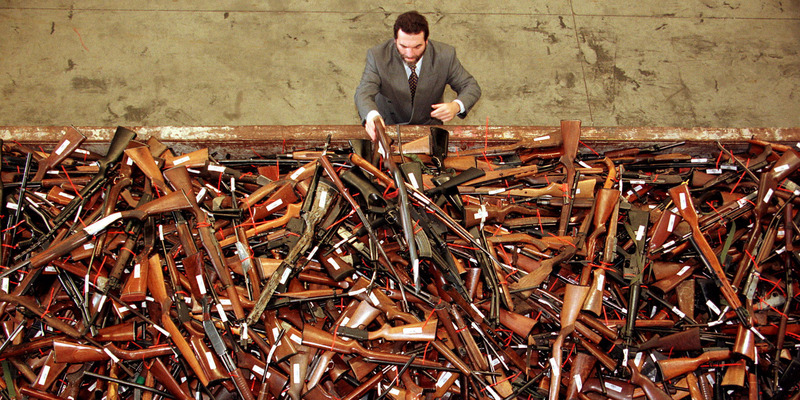 Regardless, in the end, Australia’s government would purchase nearly 700,000 guns. Percentagewise, that’s the equivalent of 40 million in the US. After Australia’s buyback and enactment of the NFA, firearm suicides and homicides dropped. As The Washington Post’s Wonkblog has pointed out, researchers from two different Australian universities found that in the decade after the NFA became law, the firearm homicide rate fell by 59% and the firearm suicide rate fell by 65% — without increases in other types of deaths. Whether the NFA catalyzed that decline, however, is still up for debate. 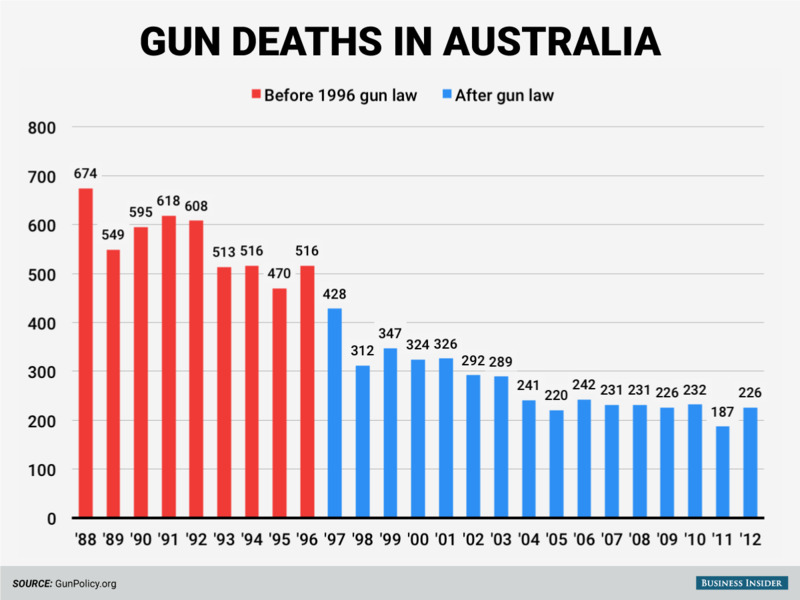 Over the last several decades, gun deaths in most developed nations have been trending downward, and studies struggle to determine how much of the drop resulted from Australia’s legislation. Causality is inherently difficult to determine in social sciences. Regardless, many analysts do believe the NFA was effective. He did, however, acknowledge Australia’s differences from the US: a more urban society, nothing similar to the US Bill of Rights or Second Amendment, and no organisation like the National Rifle Association. The US is also arguably in a tougher position than Australia was in 1996. America has one of the highest rates of gun ownership in the world. And although statistics vary, criticisms like Obama’s about the frequency of massacres aren’t incorrect. 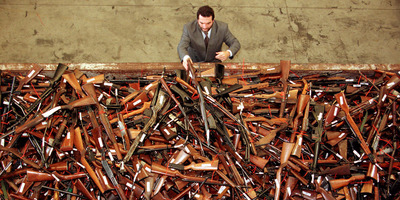 ReutresMick Roelandts, firearms reform project manager for the New South Wales Police, looks at a pile of about 4,500 prohibited firearms in Sydney that have been handed in 1997 under the Australian government’s buy-back scheme. For example, from 1966 to 2012, the US accounted for 31% of mass shootings around the world, Adam Lankford, an associate professor at the University of Alabama Department of Criminal Justice, recently told The Wall Street Journal. That’s more than any other country. On top of the tangible numbers, recent research, with data from the Brady Campaign to Prevent Gun Violence, suggests that mass shootings, like the recent ones in San Bernardino and California, lead to copycats and help perpetuate the violence. Within 13 days, the original incident is “contagious” and incites as much as 20% to 30% of subsequent shootings, according to a study published in the journal PLOS One. And, as Vox has pointed out, research shows a strong correlation between the amount of guns and the amount of gun homicides — on a national, state, and personal level. Regardless of the unique challenges the US faces, Obama is well aware of Australia’s massive effort — and the subsequent decline in violence. “When Australia had a mass killing … it was just so shocking the entire country said, ‘Well, we’re going to completely change our gun laws,’ and they did. And it hasn’t happened since,” he said earlier this year on comedian Marc Maron’s podcast, according to NBC.